WVU Libraries has raised $ 10,236 from 33 gifts! 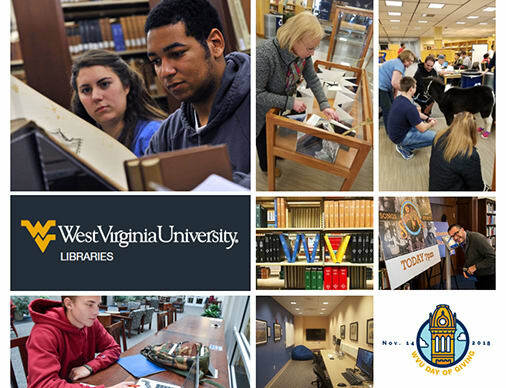 WVU Libraries are the spaces, people, collections and services that support all WVU campuses and all fields of study, from engineering and the arts to science, media, business and medicine. While we are known for our more than 2 million print volumes and over 90,000 serial titles (mostly electronic), the libraries also offer continuous access to classroom learning, research and technology and opportunities to gather in our historic spaces. WVU Libraries teach information literacy, assist researchers in the advancing digital landscape, loan laptops, offer study space, operate interlibrary loan, host exhibits and events and advocate for open access. To support West Virginia University’s R1 research status, our libraries must be acknowledged as the best worldwide. We are continually evolving in the physical and digital landscape, gathering and teaching with firsthand materials from our special collections, offering a space for cross-campus and community collaboration and supporting the needs defined by our faculty and students. With the escalating costs of electronic and print resources, of more technologically advanced teaching and study spaces and the challenge of building top-notch collections, we need your support now more than ever. Your donation will touch the very heart of the student experience at West Virginia University. This fund helps us fill the most urgent demands, supporting important purchases of library resources and technology, upgrades in student services and one-of-a-kind programming opportunities. This fund supports the unique needs of our Health Sciences community, providing research resources, study space and technological access that strengthens and is integral to the student experience in the medical professional fields. Gifts support the specific scholarly acquisitions of our primary source collections, including the Rare Book Room, the Appalachian Collection, the Congressional Archives, our genealogy source material and many others. Used by researchers worldwide and WVU students from all colleges and schools, our first-class materials establish WVU on the international stage. Libraries Dean, Karen Diaz, will generously match donations made to any WVU Libraries' Needs on the Day of Giving up to a total of $1,000. Help us meet this match by making a donation to our Libraries’ Greatest Needs, the Health Sciences Library or the West Virginia and Regional History Center. The first 25 gifts made on the Day of Giving to any of WVU Libraries' Needs will unlock an additional $1,000 donation to support library resources through the Naresh and Indira Shah Library Endowment. Help us unlock this challenge by making a gift to WVU Libraries!